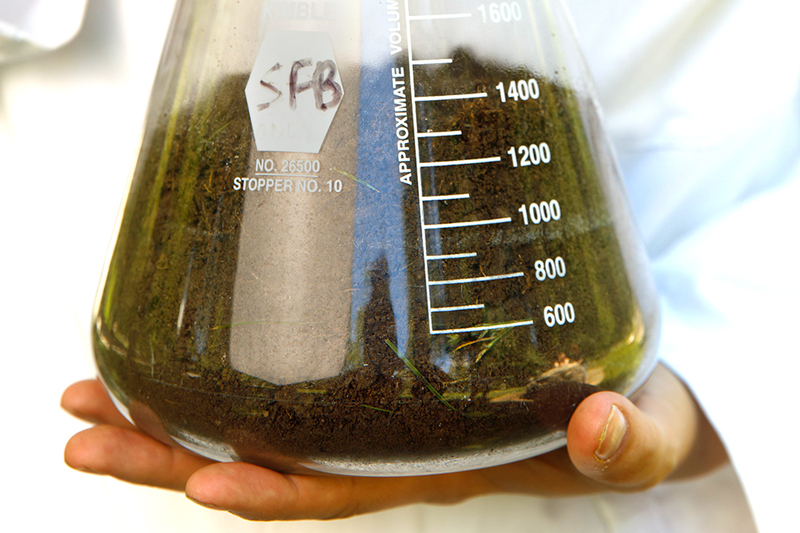 Soil is a rich source of bacteria, some of which produce molecules that act as natural antibiotics. For decades, doctors have been using antibiotics to fight tuberculosis (TB). And consistently, the microbe responsible for the disease, Mycobacterium tuberculosis, has been fighting back. When confronted with current drugs, such as the antibiotic rifamycin, the bacterium often mutates in ways that make it resistant to the treatment. Rates of rifamycin resistance are steadily rising, which presents a major problem to doctors attempting to treat TB. But, according to a new study from a team of Rockefeller scientists, nature might have come up with a solution. The study, published in Nature Communications, suggests that an antibiotic found in dirt can destroy mutant mycobacteria. Rifamycin, or Rif, works by targeting RNA polymerase (RNAP), an enzyme crucial to bacteria’s survival. Resistance develops when the genes coding for RNAP mutate: Even a small genetic change can prevent Rif from binding to the enzyme and obstructing its function. To circumvent resistance, researchers needed a drug that acted like Rif, but that could bind to RNAP, even in the presence of mutations. And while some scientists might turn to the lab to synthesize such a molecule, Sean F. Brady, the Evnin Professor, turned to the environment. To identify any such analogs, Brady’s lab sequenced the genes of microbes found in soil samples collected from locations across the country. They hoped to uncover antibiotics that were genetically related to Rif, but with small variations that allowed them to bind to mutated RNAPs. That’s exactly what they found. Through their soil probes, the researchers discovered a group of natural antibiotics, known as kanglemycins, or kangs, that share most of their genes with rifamycin. Moreover, analyses by postdoctoral associate James Peek revealed that these antibiotics are capable of combatting bacteria that don’t respond to Rif. Brady hypothesizes that kangs might have emerged in response to evolutionary pressures that mirror those present in hospitals. In a clinical setting, bacteria react to antibiotic onslaught by evolving protective mutations. In turn, researchers create more powerful antibiotics; and, over time, bacteria develop further mutations to evade these new attacks. In nature, Brady postulates, bacteria and antibiotics may engage in a similar arms race. Bacteria in dirt compete with one another. And one way for a bacterial species to take out the competition is to produce toxins, like Rif, which act as natural antibiotics. Like bacteria in hospitals, bacteria in soil respond to such threats by mutating in ways that confer resistance to the toxins. But, in time, their rival bacteria might also mutate, producing yet stronger antibiotics. Kangs, speculates Brady, may be the result of this kind of competition. To understand what makes these newly discovered antibiotics effective against mutated TB strains, Elizabeth Campbell, a research associate professor, Seth A. Darst, the Jack Fishman Professor, and senior research associate Mirjana Lilic analyzed their structure. They found that, though their kangs resembled rifamycin, the antibiotics had several distinctive features, including an extra sugar and an extra acid, attached to the core structure. These microscopic flourishes, the researchers learned, endowed the molecule with a new way to bind to and interfere with RNAP, allowing the kangs to target bacteria unaffected by Rif. “We found that the extra sugar allows the kanglemycin to dock into a pocket of RNAP that other drugs didn’t take advantage of,” says Campbell. In fact, she says, prior to this study scientists were unaware that such a pocket even existed. The discovery of this docking station supplies researchers with a new strategy for developing yet more powerful antibiotics. Now aware of the hitherto hidden RNAP pocket, scientists can search for, or synthesize, novel drugs that exploit it. DNA’s two strands must be separated before its code can be read, or transcribed. By studying the structure of the enzyme RNA polymerase, researchers have elucidated how DNA unwinds and becomes legible. In discovering how an antibiotic kills the bacteria that cause tuberculosis, scientists open the door to new treatments for the disease—and possibly others, as well. In mining soil for natural drugs, scientists have discovered a brand-new antibiotic potent against many bacteria. They hope it could be used to treat infections that cannot be stopped with existing drugs.